Is Your Building Costing You Money? 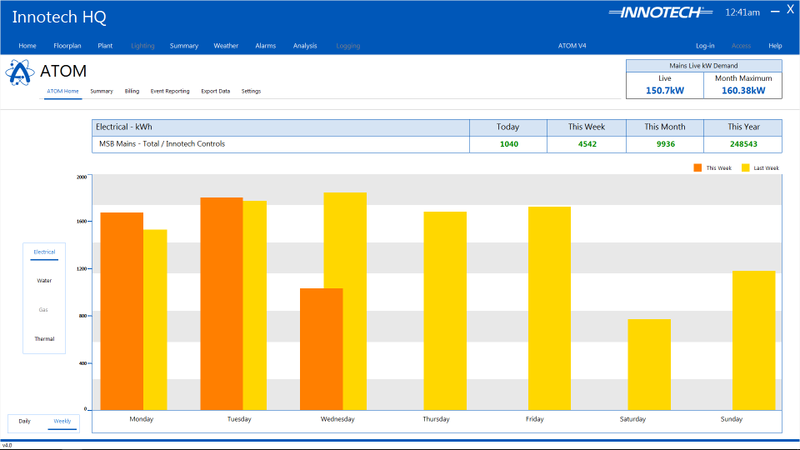 Do you need a simple, intuitive interface to analyse your building performance and cost? ATOM ensures early detection of system inefficiencies, creates ongoing savings and helps reduce your total carbon footprint. ATOM enables you to analyse historic data, generate reports and billing information while helping you to analyse and monitor the performance of your building and environmental impact. Additionally client specific Dashboards can be created using ATOM technology. These are great for foyers in hotels and commercial businesses. The home page provides the total of the selected meter (typically a primary meter) giving a complete overview of the site or campus. 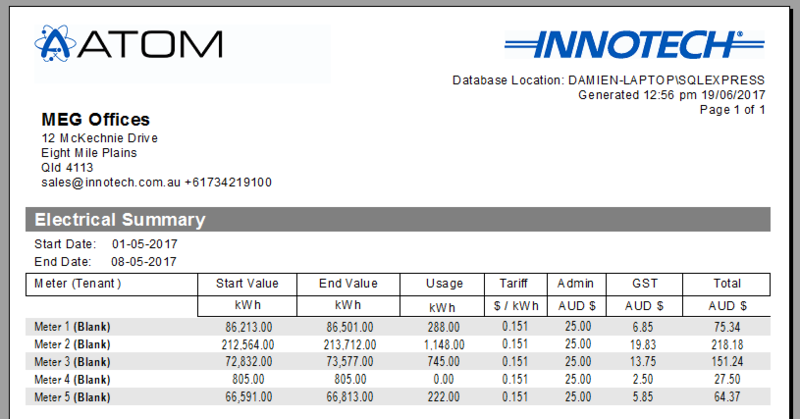 At a glance you have available the actual kWh usage for the day, week, month and year for each building service. Watch the Introduction to ATOM video or view the main ATOM product page to learn more. ATOM may be used in conjunction with an existing Building Management System (BMS), or incorporated within a complete Innotech BMS solution. Implement ATOM as either a standalone or multiuser web based solution with support for up to 10 concurrent users via Innotech eServer. The incorporation of complex SQL queries and real-time data allows ATOM to create a solution suitable for Clients, Consultants or Facility Managers. Contact our Sales Team or view the main ATOM product page to learn more about ATOM. This report shows the historical information for the selected service. The usage values are coloured to provide the operator quick visual reference when values are under the targets, or have exceed the target. Daily, Weekly, Monthly & Yearly historical usage can be viewed for each tenant. An ambient temperature comparison may help indicate why there is a higher than usual electrical usage for that period as heaters or compressors may have been required to maintain conditions for the mechanical services. Overlaying the targets can also indicate where usage has been exceeded and from there you can interrogate the cause. 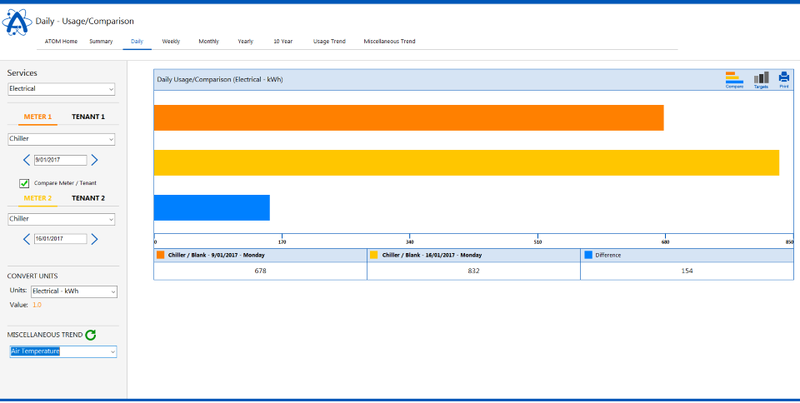 Comparing the usage between tenants, or the same tenant at a different time is achieved via the Compare Reports Selection. Clicking the difference comparison button, provides a simple visual total for each tenant and the calculated difference for the period. 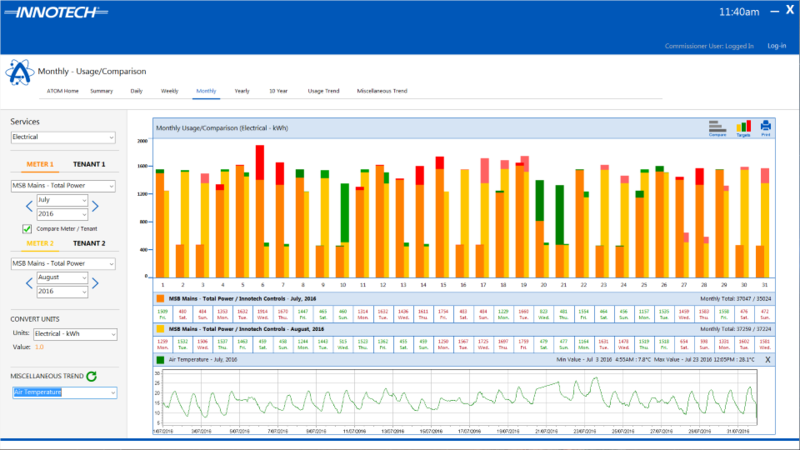 If a High Level Interface (HLI) via protocols such as BACnet is available for a particular smart meter, the HLI page allows quick reference and analysis of real-time and historic trends and data. The Tenant usage data is displayed as shaded areas of consumption for each hour of the day, allowing the operator to quickly identify any anomalies that may require further investigation via the many features built into ATOM. Tenant billing may be generated for the available services, such as Electrical, Water, Gas, Thermal Energy proportioning of Electrical usage and even Hours Run, complete with an Activity Statement. You have the ability to export selected reports to a local formatted CSV file for further independent analysis or distributed to students for sustainability education. View the main ATOM product page to learn more about ATOM.